You know you want him. Everyone, and I mean everyone needs a Darth Vader of his or her very own. I’ve been waiting for the right Vader. And I think my day has come. This Vader is 19” tall, it features voice and sound effects, and would ya just look at the details on the costume? It’s film accurate to the Empire Strikes Back. Vader also includes over 25 points of articulation and a movie-true lightsaber accessory. One more thing, the price is very attractive. 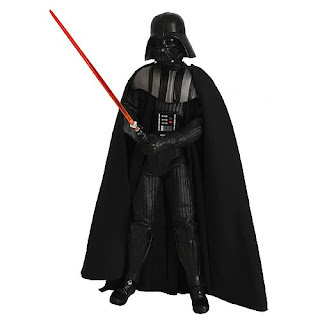 Order Star Wars Darth Vader Ultimate 1:4 Scale Action Figure from Entertainment Earth! Let’s just discuss the magic of pre-ordering for a moment (in case you forgot or didn’t know). - You don’t miss out on limited editions or sell outs because you’re pre-order is locked and in. Remember how fast the Dr. Horrible maquettes went? I almost missed my chance with those. - You get it out of the way now. It’s convenient, and you don’t have to worry about forgetting to get the on its release date. (I love this for comics and new DVDs). - Pre-orders are liking giving yourself surprises. I pre-order, then forget about it, and a package shows up on doorstep after the release date. It’s like Christmas without the pesky gift wrap. And the best part? Pre-orders are made of awesome because your card doesn’t get charged until you actually place the order (at least with Entertainment Earth. You might not have the cash now, but you can put down your card info and plan to have the funds in August 2010. You can call it your Darth Vader stash for extra coolness. *The lightsaber in the final product will be different than the one pictured. Oh yes, he'll look lovely with the lego Stardestroyer!